You remember this ^ right?! Well, Born Pretty Store has a Gangnam Style stamping plate and I am going to show it to you today! The blue film on the front peels off nice, clean, easy, and all in one piece just like the big-name plates we're all used to. Also, as is typical with Born Pretty Store plates, there is no backing, but the same blue film instead. Therefore the plate is fairly sharp and requires more care when using it, but this doesn't bother me since I put a non-slip backing on all of my plates anyway. You can see how I do that here. So the real question is: how does this plate stamp? Sure, the $2.99 USD price tag is pretty, but it's not worth it if the quality isn't there! So I grabbed one of my Color Club Halo Hues, Beyond, and a white stamping polish I also got from Born Pretty Store to test it out. My base color is the water-based polish that I got from Born Pretty Store that I showed you on Friday. Their stamping polish, by the way, is awesome! I reviewed it before here, and I love it. It is so opaque! There are eight different images on this plate, but there's not a ton of variety. It's got Psy's face twice, one is just smaller than the other, a foot, the word "style", dancing Psy, Psy with his arms crossed, an image of just crossed arms, and the elongated skull face-type full-nail image. I can kind of understand having the face and arms separately, plus combined, but what's really the point in just crossed arms or a foot. Or two different sizes of the same image? There were tons of other things in the Gangnam Style video that would have been appropriate to include, instead. Overall, I am happy with this plate. I wasn't really sure what to do with the two middle images. They are just kind of there and don't have much purpose, but all of the images (surprisingly, including the word) do pick up and stamp clean (the smudging is from my inability to stamp well) and full. I absolutely love the full-nail image the most! It looks like one that will be great for some sort of Halloween design, too! If for no other reason, you need this plate for the novelty of it! 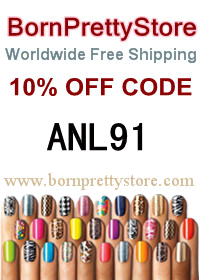 If you do decide you need it, make sure to use my coupon code ANL91 and you'll get 10% off your order! This product was provided by Born Pretty Store for my honest and accurate review.